Approximately 3 weeks after Ashley Greig first wrote her heart-wrenching note on Facebook about her disappointment of how Panasonic Beauty Malaysia conducted their shortlisting on the contestants, Panasonic Beauty Malaysia has released a statement on their Facebook page to call off the entire competition. Ashley herself was one of the contestants who gathered the most number of votes from the public but was singled out by the judges and did not make it into the shortlist to continue on to the final round of the competition. Tih Tjun, a representative from the marketing department of Panasonic Malaysia, said that they “deepy regret that [their] contest has been received in such a negative light” and that “the intention of the contest is to encourage girls and women out there to acknowledge their self belief, and celebrate loving one self”. They also apologised if they have “offended anyone or erred in any way possible”. As for the other contestants, they will be given a gift for their participation and contribution. Well that should solve all the drama, shouldn’t it? Big fat nope (excuse the pun, but I do think it’s quite appropriate in this case). 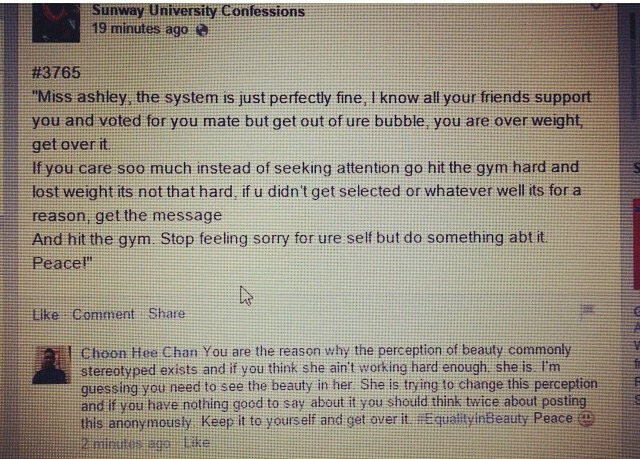 Instead, Facebook users posted condemning and angry comments on Panasonic Beauty Malaysia’s Facebook post, demanding that a public apology is given to Ashley herself. The real question here is: What should Panasonic Beauty Malaysia have done then? Scenario 1: They apologise and invite Ashley to join in the other shortlisted participants to continue to the next round. This would cause the general public to say that the organisers of the event are merely doing this to shut everyone up. It would be as if they are just doing this because the complaints and boycott threats are ‘forcing’ them to. Thus it would be extremely insincere and the genuineness of the contest would be compromised. Also, think of how the other contestants would feel? Perhaps some would even complain that they have been shortlisted fair and square and with the reentry of Ashley, who is now already famous thanks to the organiser’s mistake. Chances are the public would vote for her and she would ultimately win the entire competition. 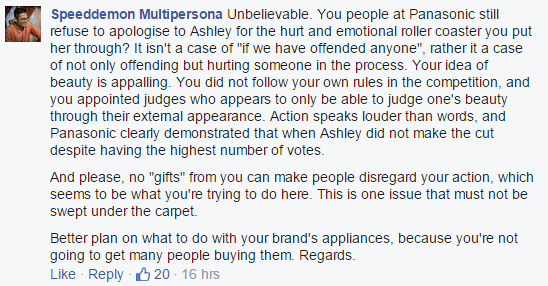 Scenario 2: They stick to their decision of not shortlisting Ashley, and give her some merchandise as an apology. This would just seem like plain bribery – “Here take our Panasonic goods and don’t make a fuss anymore”. More sh*t would most definitely hit the fan. Scenario 3: They apologise publicly to Ashley, admit to everyone that they did not shortlist her due to her physical attributes, and say that they’ve realised their mistake and would not repeat it again. You see, the problem with their Facebook statement is that they did not provide a clear explanation on why Ashley was not shortlisted. If it isn’t because of her physical attributes that fall short of a typical slim and tall model, then why the fear of explaining the real reason to the public? And if it IS because of her weight, then why not admit something that the public is already aware of anyway? After all, most would say that admittance is the first step to a real and genuine apology. Perhaps this is what’s lacking in their statement. Because you cannot fix a hole, if you don’t acknowledge the presence of the hole in the first place. How About Ashley Greig’s Corner? Ashley isn’t just sitting on a bed of roses either. When I last spoke to her about two weeks ago, she told me that surprisingly enough, she has not yet received much negative or demeaning comments from the public and that support from strangers have been overwhelming. While the news of this contest has garnered much local and international attention, it seems that people are stepping up to criticise her efforts to change the perception of beauty and ask her to accept the decision made because it is a contest. 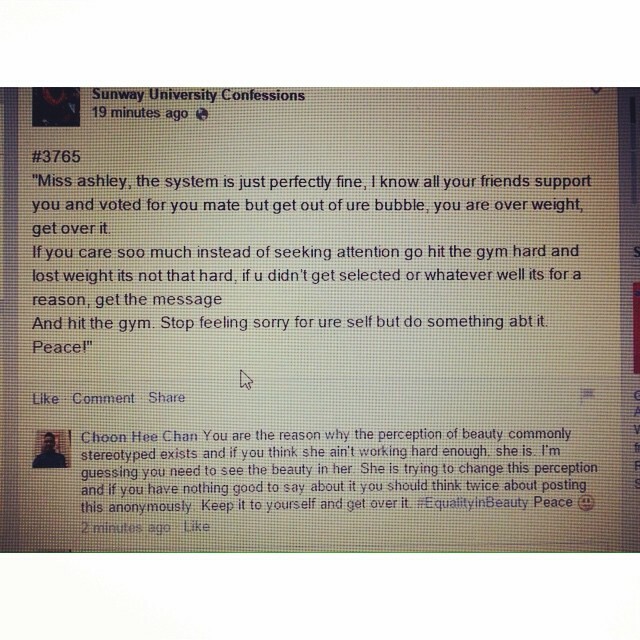 A Facebook user posted anonymously in a confessions page that Ashley should ‘go hit the gym hard’ instead of ‘seeking attention’. 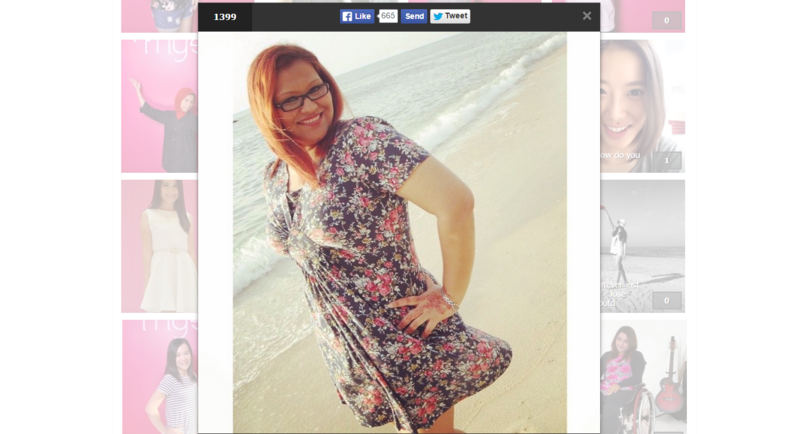 Ashley, however, has remained optimistic and is far from giving up. In her recent Facebook post, we can be certain that she is about to bring this fight to another level. I hope that this said company’s PR team is a lot better than Panasonic Malaysia’s.